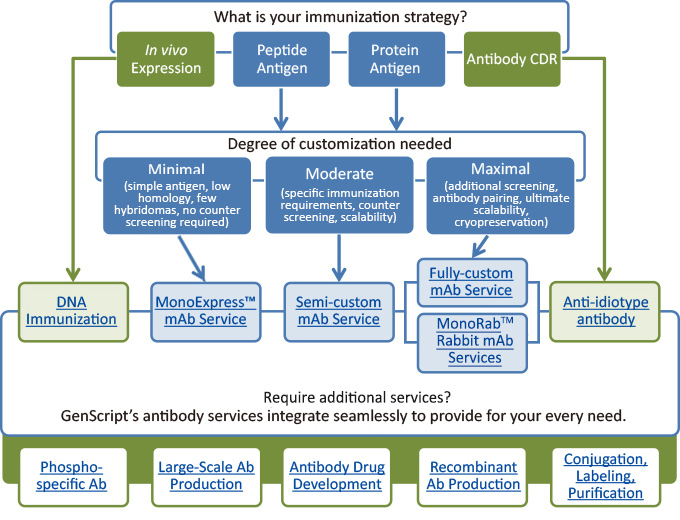 Whether it's your first time developing a monoclonal antibody or you have exacting protocol requirements, GenScript provides comprehensive service packages for monoclonal antibody development at all levels of control. Our MonoExpress™ package carries industry leading application guarantees and delivers supernatants in just 45 days. Need a little more control? Our semi-custom package offers the flexibility of a custom service but with simplified protocol building blocks that adapt the service to your needs. For ultimate control, GenScript's fully-custom monoclonal antibody generation services offer ultimate control at every phase of the project, allowing you to modify, restart, or even cancel your project. Require antibodies with higher affinity/specificity? GenScript's MonoRab™ rabbit monoclonal antibody generation services can meet your specific needs as a better option for mouse mAb services. We even offer specialized services including phospho specific antibodies, anti-idiotype antibodies and more. Use our selection guide below to see our complete range of services and decide which package is right for you. Optimized immunization: Our advanced technologies - OptimumAntigen™ design tool, intelligent Antigen Strategy, proprietary immunization technology, and optional GANP® mouse technology - increase the specificity and affinity of our monoclonal antibodies. Certified facility: AAALAC International accreditation and OLAW certification, demonstrating our commitment to responsible animal care and use. Guaranteed results: ELISA titer and Western blot guaranteed packages available. Fast turnaround time: Delivery of monoclonal antibodies 3 weeks faster than our competitors. Strict Confidentiality: No project associated information and products will be disclosed except to the project owner. ZERO setup fee: Our confidence and near 100% success rate limit the risk to you. drug development from lead generation, through characterization and antibody production.